The Girl And Her Camera: Neelkanth Mahadev Temple: An Offering Business Hub? 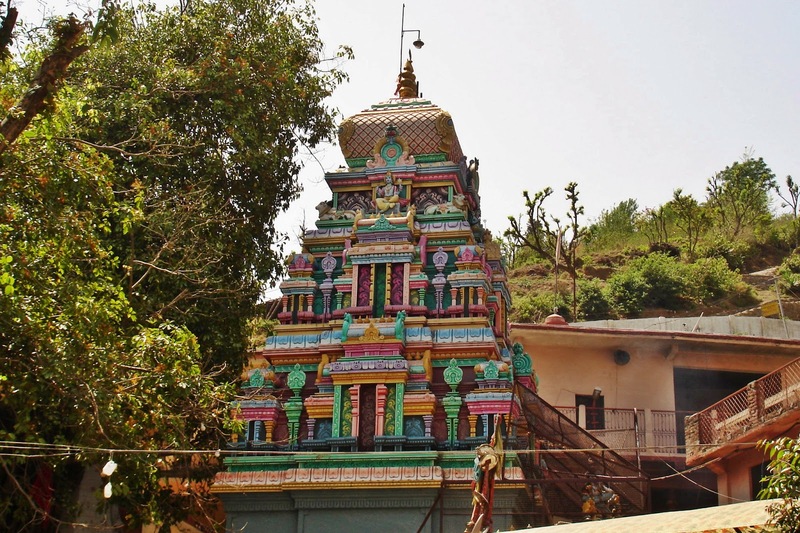 Neelkanth Mahadev Temple: An Offering Business Hub? This is the side view of Neelkanth Mahadev Temple located around 20 kms. from Lahksmanjula, Rishikesh, Uttarakhand, India. It is one of the many nearby temples around Rishikesh that invites several hundreds of visits each day. I was one of these hundreds, along with my husband, on that day 16th April 2013. We are not devotees but curiosity drives us there. We were curios what the temple looks like (found out it's similar to other temples - nothing much new and extraordinary) and how are the surrounding areas look like. A few meters before our jeep came to a halt we already witness the long line of parked jeeps and cars and, of course, all those commercial stores which offer all sorts of goods eatables. What struck my husband that day, as we proceeded to walk farther to get a glimpse of the temple area, was that people -those who called themselves devotees and went there for personal reasons, suddenly realized to buy some offerings to offer to the gods. I mean, have they not thought about it before leaving their own house/place? Their visit could have been more authentic (in the sense that they have thought about it already) if they have prepared something as an offering to the gods, right? When we visit a friend or a relative it's courteous to bring something from home, isn't it? And what kind of idea it is to offer the gods things that are already his/hers/theirs. Everything on earth is his, isn't it? So, what these people do is purely nonsense to us! We observed further. People taking lunch and what were they doing? Throwing left-overs, wrappers/plastics/papers/bottles anywhere they please. So you see, the action is horrific! The surrounding areas of the temple itself is full of plastics and other wastes. It literally stinks. Could there be a god sitting there and waiting to be worshiped when all he (the god -if he exists) could ask for is to make his place clean and livable? Nah, all people do is destroy everything not minding the impact of their actions. Anyway, to reach Neelkanth Mahadev Temple you have to cross Lahksmanjula Bridge. After crossing the bridge go left and walk a few meters then you'll find taxi/jeep stand. Each passenger has to pay Rs. 100 for both ways -same jeep will be your ride while coming back. There is also an ambassador taxi which you can hire for Rs. 700. The journey takes around an hour to go there, another hour to stay at the temple area, and around another hour to come back. If you are bringing your own car, then you have to divert your way from Haridwar to Rishikesh and not the usual highway - remember the bridge to cross? Yeah, only two-wheeler vehicle and people can use it! The road is fine, tarred, winding and hilly -of course! It's nice on the way only to be a sore in the eye when reaching the stop to the temple. The worst temple area we have visited, so far -not that this one is different from the other temples we have visited. We didn't even go inside the temple. We just passed by. I just took this picture and we're gone. That's how disgusting it was! We just went ahead to a road that leads to a cave (about 3 kms), they said. But because we didn't have much time to trek we decided to just climb a little farther and came back to the place where our jeep awaited.